Putting numbers on the End TB Strategy—an impossible dream? 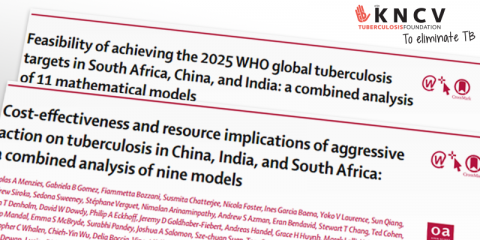 A unique international collaboration consisting of 11 different tuberculosis modelling groups, as well as public health officials from NTPs has resulted in two papers evaluating the feasibility of the WHO End-TB Strategy targets. The ambitious targets aim to reduce tuberculosis incidence by 50% and mortality by 75% by 2025. KNCV experts contributed in the study, with Michael Kimerling, director of the Technical Division at KNCV co-authoring. The study assessed the feasibility, costs, and epidemiological outcomes of country-specific interventions in India, China, and South Africa. Controversially, only the South-African NTP could feasibly be expected to achieve these targets, and only with a combination of continuous isoniazid preventive therapy for individuals on antiretroviral therapy, expanded facility-based screening for symptoms of tuberculosis at health centers, and improved tuberculosis care. Achieving the End-TB-Strategy’s targets would require tripling government health spending, although this could be considered cost-effective, especially for individual patients whose costs would substantially be reduced.